There are some times when you start reading a book, you are transported to a different world altogether and once it is done you sigh with utmost satisfaction and at the same time wish the story would continue for ever and ever. The School Essential Ingredients by Erica Bauermeister is one such delicious read. It is a story about a chef, a restaurenter, Lillian who teaches cooking classes every Monday, each month. A disparate group of people assemble together for one such cooking class (for various different reasons) and they are all connected by one common thing - their immense Love for Food. Each chapter tracks back and forth into each of their lives, their circumstances, their happiness, their sadness, their loss. As you read more & more eventually, you become one of them, you feel for them. Your taste buds dance and tickle every time Lillian describes why & how a recipe is made. The adjectives with which each smell, each feeling, each gesture is described is just spell-bounding. .You will see the world and the food you make in whole new way after reading this book. One of most popular posts (as per Blogger Stats) here on my blog is - my Mama's Vegetable Biryani and Aloo Korma (from way back in 2008). Today, I am posting a modified version of the same recipe which I made for the Diwali and Halloween potluck party at work, along with the Eggless Blueberry Coffee Cake. A rich, dense, nutty gravy is what is needed as a base for a 'Korma", though I used it very loosely in this case as, as per wikipedia, it can be made with yogurt, cream, nut and seed pastes or coconut milk . From vegetables to eggs to even meat, anything & everything can be added to it. 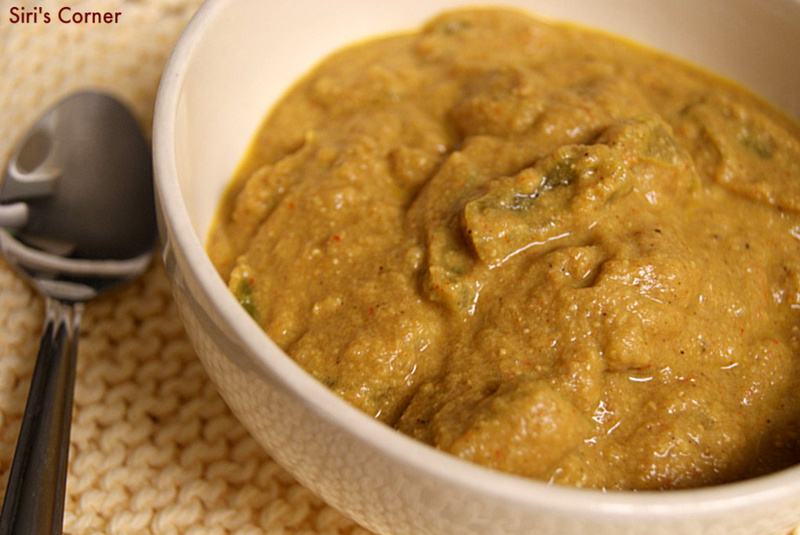 This korma recipe is from my mom who still cooks this up in the most delicious way. Don't be surprised when you see that the recipe asks for only 2 tablespoons of peanuts or 1 tbsp of poppy seeds. Everything get adds up and it serves atleast 3-4 servings. Tastes best when served with my mama's Vegetable Biryani. Peel and cut 2 potatoes into cubes and boil them, until a bit firm. Grind all of the above with 2 tbsp of tamarind pulp and 1/2 cup of water. Heat oil (about 1 teaspoon) and saute 1 chopped onion, until golden brown. Add 1 chopped tomato pieces. Cook until mush. Cool down a bit and grind with little water. Keep aside. Heat about 2-3 teaspoons of oil, add chopped bell peppers with little salt. Cook them for about 6-7 mins. then add onion paste and masala paste from Step 1. Cook on medium low flame, until oil starts to separate. Season with salt, turmeric, red chilli powder and garama masala, as per taste. Add the boiled potato pieces. Cook for 2-3 mins. Finally add 1/3 cup of beaten yogurt. Mix well and cook for 4-5 mins. Variation: Any veggie can be substituted with bell peppers and potato. I made the same with boiled eggs and it tasted equally yummy. The gravy looks exotic with cashew, peanuts, poppy seeds and coconut in it. Lovely recipe, Siri. I love potato and bellpepper combo in kurma very much..yummy gravy.. Looking to read that book. How have you been Siri. Kurma looks really creamy and delicious. Wow, that book does sound interesting and so does your recipe. It looks so good! !The book sounds as good too!! That's so yum and creamy! Siri, very lovely layout..and your FB page is still not loading..nice reading abt the book..it's been a while since I read a book actually so it was good reading about your exp..
Hi Siri, wonderful korma recipe, the curry is excellent. I just made it for dinner. Thanks everybody. Glad you all liked it :).